There’s always plenty going on throughout the year in France’s 5th largest city from the early morning flower market on the Cours Saleya to the late-night bars dotted around the historic Old Town. This month, however, Nice goes into party season with their annual carnival festival. Regarded as one of the largest in the world—alongside Rio and Venice—the Carnival de Nice attracts over a million visitors and has taken place every year since 1873. Kicking off on February 16 and continuing until March 2, this year’s theme is entitled “King of Cinema”. It’s in celebration of the 100th anniversary of Nice’s Victorine Studios—the Mecca of the film industry on the Côte d'Azur and an important landmark of France’s much-lauded film industry. There are two main focuses during the two-week long event. The Carnival parades feature 17 floats which travel around the streets of Nice to the sound of live music and attract musicians and dancers from all over the world. There are various evenings when these floats are lit up for special night time parades, too. Then there are the flower parades—or “battles” as they are known— where dozens of performers throw tonnes of fresh flowers to the watching public from beautifully-decorated floats. Don’t forget to buy a ticket to the Nice Carnival before going and if you go in fancy dress there’s a chance you won’t have to pay at all. The Riviera is one of the most expensive regions to buy in France and Nice, alongside Cap Ferrat, Antibes and St Tropez and Cannes, is no exception. However, the city is large enough that it always has a wealth of stock on offer from vast Belle Epoque palaces to bijou apartments and everything in between. If you want to be close to the action in Nice but can’t afford the city prices, have a look at traditional villages nearby that include Tourettes-sur-Loup, Vence and Valbonne. With an international airport just a few miles outside of the city, a bus ride of just twenty minutes takes you to the centre, you can easily own a home here without the need to keep a car. There’s the additional option of travelling by train, with the Cote d’Azur’s main train station, the Gare de Nice Ville, connected to the rest of France and the TGV running daily direct to Paris. Aside from the Carnival, there are so many other events that draw people to the city including the Nice Jazz Festival in July and the various festivals held down the road in Cannes. Thanks to the fact that Nice is now a hub for research in industry, science and technology, the convention centre hosts frequent events and functions, too. The most popular areas for tourists—important if you’re considering renting out the property when you’re not there—include the Old Town and the Carre d’Or. Bear in mind that despite being a seaside city, properties with sea views are a rarity in Nice and only those in or very close to the frontline will enjoy them. After Paris, Nice has the most museums in France. A recently renovated two-bedroom flat in the heart of so-called “Musicians’ area”, on Place Mozart, which is just 10 minutes from the beach and the famous Hotel Negresco, is on the market for €990,000. A two-bedroom flat which offers a panoramic sea view in Nice is on the market for €1.26m. 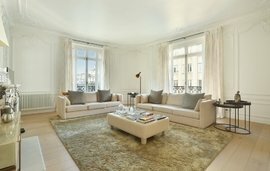 Set right in the middle of Nice’s Old Town is this large, three-bedroom apartment which comes with a sea view balcony. The asking price is €1.28m.